Bowman\'s Heating & Air Conditioning & Electrical Inc. is proud to serve the people of our local community with prompt quality service. We started in 1989, by Everett Bowman. It was his goal then and our goal now to provide all of our clients with services marked by quality, dependability, and value. Everett strove to give every client his personal attention because he valued your business. Almost 30 years later; Bowman’s still does business with the very same principles our father lived by personal attention, quality, trust, and respect. We are family owned and operated still. We install Rheem products which have industry-leading warranties and performance. Call us (703) 471-0451 today to schedule a service appointment or for a free, no-obligation estimate. We’ll help determine the best system for your home. Bowman’s looks forward to hearing from you and adding you to our long list of satisfied & returning customers. Our team services most major brands of equipment and offers yearly services agreements. We’ve been proudly serving our local community with top of the line products, service, and maintenance for years and hope to do the same for you today! 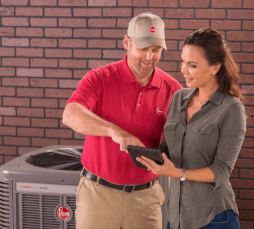 Bowman\'s Heating & Air Conditioning is your friendly local contractor servicing most brands of equipment and proudly installing industry-leading Rheem systems.